The Municipality of the County of Richmond has named Tony Pierce as our 2017 Volunteer of the Year. Tony is a resident of Arichat, Richmond County. Tony’s motivation to volunteer originated when his children started school. He began by helping with school events and his efforts grew into more active roles of fundraising and organizing school activities. Tony’s involvement then expanded to include various community groups. Tony is current President (and past vice-president) of the Isle Madame ATV Riders Association. He is also a member of the Organizing Committee for the Petit De Grat Shark Derby, Co-chair of the Superport Corporation and assists in organizing the annual Relay for Life. He has played integral roles as a member of Organizing Committee for Les Jeux de L’Acadie in 2010 and 2016, along with other community and school events, too numerous to mention! Tony gives 110% percent of himself to his community and his commitment is shown in each and every project that he is involved with. 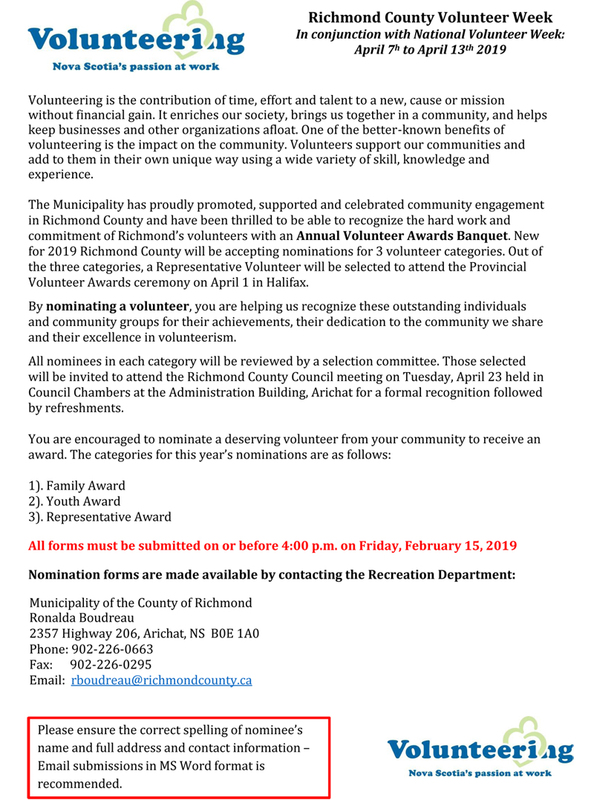 The Municipality of the County of Richmond is proud to have Tony as our Representative Volunteer for 2017!